Fermentation is a wonderful process, and fermented feeds can be successfully stored for years. For example, following a drought and lesser forage inventories within the Midwest several years ago, I came across forage from the bottom of a silo that the farmer remembered being from 1988! The forage was still of sound nutritional quality. Fermentation and preservation have been used on farms for thousands of years and happens in four phases: 1) aerobic, 2) anaerobic/fermentation, 3) stable, and 4) feedout. Each of these phases result in feed that is slightly different from the original fresh alfalfa or grass. The plant begins to change during the aerobic phase while the crop is being harvested and delivered into the silo. The wilting plant continues living despite being cut, utilizing some sugars after photosynthesis stops. Aerobic (with oxygen present) changes continue taking place after the forage is sealed into the upright silo, bag, bunker, or pile because there is still remaining air. While the oxygen concentration is small, true fermentation cannot take place until all of the oxygen is gone. Microbes that can live in aerobic conditions will chew up the oxygen and then Phase 2 can proceed. The net result from Phase 1 is a forage that has less sugar relative to the fresh alfalfa or grass. The goal for Phase 1 should be to get the forage out of the field and eliminate air as quickly as possible. Avoid taking more than a week to fill a silo and pack, pack, and pack some more with bags, bunkers, and piles to keep air infiltration to a minimum. Take great care to seal edges or silo bag ends to keep air out. During Phase 2, a period of active fermentation after the oxygen is gone, anaerobic bacteria and some fungi (yeast) metabolize sugars and soluble carbohydrates into fermentation acids. As lactic, acetic, and other fermentation acids are produced, the forage pH drops until the environment is acidified to the point that the organisms can no longer grow. This is how the feed is effectively preserved with a low pH. Typically, as acetic and other acids are produced, there is gas (carbon dioxide) generated and usable carbon is lost. What’s the bottom line with the now fermented forage as it relates to fresh? Carbohydrates from the fresh feed are lost mostly as carbon dioxide and this literally translates to reduced dry matter. The net result from Phase 2 is we lose somewhere between one and 25 tons out of every 100 tons harvested and ensiled. Moreover, when readily digestible sugars are burned up, the fiber and ash contents spike relative to fresh feed because the sugar is not there to dilute these less digestible nutrients. 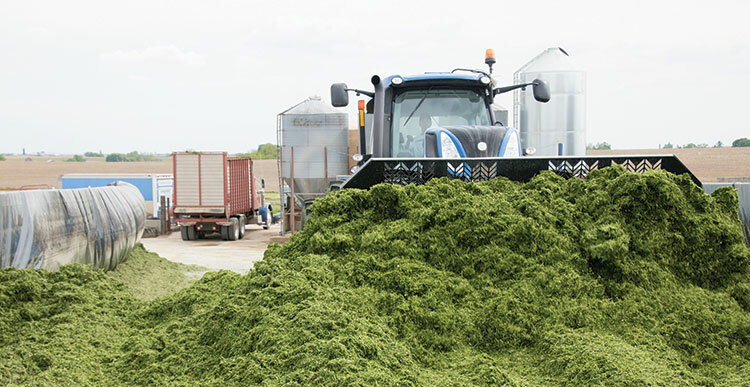 Fermented haylage ends up with less energy per ton than fresh alfalfa or grass. Though some nutrient loss is acceptable because the feed has been preserved, the goal with Phase 2 should be to drive fermentation to a low pH as quickly and efficiently as possible to minimize nutrient losses. During Phase 3, the forage remains stable and can do so for years. During the stable phase, fermented feed continues to differentiate from fresh because enzymes that were produced by bacteria and fungi during the fermentation phase leak out of the dormant microbes and into the forage. These proteolytic enzymes break down proteins and amino acids, creating ammonia and other nonprotein nitrogen sources. The net result is a higher soluble protein content relative to the fresh grass or alfalfa. Dairy and feedlot cattle can utilize the nonprotein nitrogen because bacteria within the rumen can rebuild these nitrogen compounds into amino acids and proteins, but the rumen bacteria need to expend energy to do so. The goal should be to limit soluble protein; aim for ammonia-nitrogen to be less than 10 percent of the total protein. Finally, during Phase 4 the fermented forage is exposed to air again at feedout. Ideally, the fermented feed maintains all of its nutritive value preserved in Phases 1, 2, and 3 and is stable into the feed mixer and then into the feedbunk. However, all too often mold and yeast that went dormant during Phases 1, 2, and 3 spring back to life when exposed to air. The yeast can create heat by burning fermentation acids and more carbohydrates. Then, when the pH rises as acids are metabolized, mold can set in. The aerobic deterioration result could be a catastrophic downward cycle that robs the haylage of even more nutrients. The outcome in Phase 4 could be a haylage that is even further depleted of nutrients relative to the fresh alfalfa or grass. Further yet, if mold and yeast take hold substantially, the feed can be detrimental to the rumen digestion of other ration ingredients. Recognize that the ideal fermented haylage will only lose a small amount of carbohydrate relative to the fresh-cut forage. An average haylage likely loses five to 10 tons for every 100 tons of fresh forage; poorer haylage could lose 25 tons or more. Monitor and then harvest forage at the ideal moisture range for your silo and then keep air out with aggressive and purposeful practices. This article appeared in the November 2016 issue of Hay & Forage Grower on page 12.